Power Only Measurement head provides the flexibility to easily and accurately measure the optical power of laser sources from 400 nm to 1000nm. This sensor is an integrating sphere-based power measurement head for either free-space or fiber coupled measurements. The OMH-6703B Silicon Power Head measures from 400 to 1000nm. 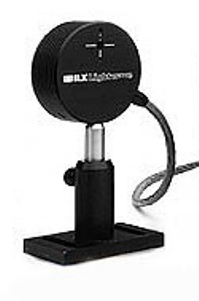 The OMH-6703B is intended for use with the ILX Lightwave OMM-6810B power meter. With the 6703B head , the OMM-6810B measures the optical power of short wavelength semiconductor lasers. In addition to precision power measurements, the OMM-6810B offers features such as log/linear display modes, auto ranging, user calibration, and reference measurement capability. With an IEEE standard GPIB interface, these features combine to make this instrument a cost-effective laser diode development or production test tool.